Ok, these aren't technically cookies (though the recipe my MIL sent me calls them cookies) but they are a favorite of Matt's & he wanted them with this year's Christmas cookies. To me these taste like a really rich brownie layered with raspberry. In my book you can't get a much better pairing than raspberry & chocolate. These do not freeze well which is why they were the last baked good I made for this holiday season. In a medium saucepan melt the butter & unsweetened chocolate over low heat. Remove from the heat & stir in the sugar. Stir in the eggs one at a time. Add the vanilla then stir in the salt & flour. Pour the batter into a greased 15x10 inch baking pan with sides. Bake for 15 - 20 minutes until firm. Let cool in the pan. 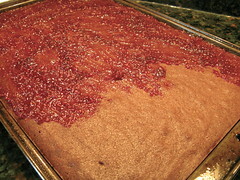 Spread a thin layer of the raspberry preserves over the top of the cake. Cut the cake in half lengthwise, then again crosswise to make 4 rectangles. 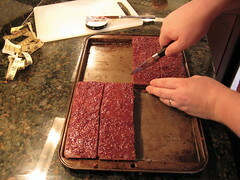 Loosen from the pan & stack two rectangles high with the preserves facing up (you'll have two stacks two layers thick). Cut those rectangles into 2x1 inch squares. Melt the 3 oz of remaining chocolate in a saucepan over low heat. Drizzle over the top of the squares. (I found a fork was best for getting good drizzles). Chill to set the chocolate. I love sacher torte, haven't had it in years. Are these related to the Sacher Torte? I recall apricot preserve in it. Regardless, I do love the chocolate and raspberry combo and these bites are moist to the max! These look fantastic, kat! Merry Christmas to you and your family!! These look beautiful! I love chocolate and raspberry. Merry Christmas! OOoh sacher petits fours.. I was just wondering how to scale my sachertorte recipe for this! 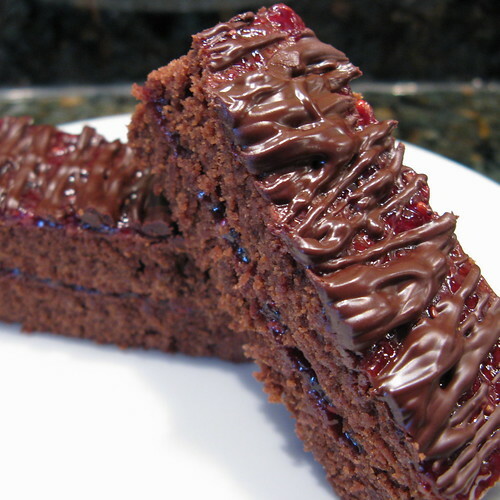 My mother is from Austria and would make the yummy Sacher many times. She made it with apricot or raspberry preserves. I like the apricot but LOVED the raspberry. Thanks so much for sharing this recipe. Happy Holidays. Those are gorgeous! I'm sorry those weren't on my Christmas cookie platter! How delicious! OHMYGOODNESS that looks drop dead gorgeous! That looks good! Chocolate and raspberry is a great flavour combo! Se ven deliciosos, muchas felicidades, y muy linda tu pagina. Saludos de Cecilia.